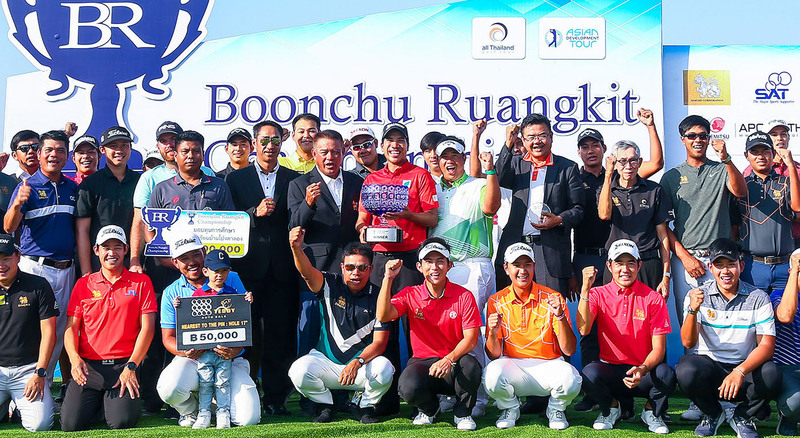 Itthipat Burantanyarat fired a final round 7-under-par 64 to win by two shots at the Boonchu Ruangkit Championship on Sunday. The 25-year-old, who was one shot behind the leader into the final round, was on 26-under-par 258 at par-71 Rancho Charnvee Golf & Resort. He earned himself the second All Thailand Golf Tour title after success at the Singha Championship 2015 and received 700,000 baht and also 10 world ranking points. It is also his third win on the Asian Development Tour (ADT). American Johannes Veerman made a final charge with a 63, to share second place on a 260 total with England’s Steve Lewton, who ended his campaign with a 66 at the Rancho Charnvee Resort and Country Club. “On hole 11 I hit it in the water and made bogey which made me a little nervous with everyone catching up. But I was still able to control my emotions and rely on my short game,”Itthipat said. “I made three birdies in a row from there which really gave me that last bit of confidence going into the last hole. The Thai, who successfully made the mark at the Asian Tour Qualifying School in January, is thrilled to find his groove so early on in the season and hopes that it will provide a timely boost as he aims to win his maiden victory on the region’s premier Tour. “I am very happy to be finally back to winning the title. Winning on home ground and in a tournament under Boonchu’s name. I have wanted to win this tournament so bad and I finally did it. “My game wasn’t that good and I was struggling for a bit the last couple of years. 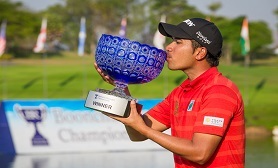 But now I am just confident in my game and it gives me confidence to win on the Asian Tour,” added Itthipat. Veerman took pride in his performance at the ADT and ATGT season-opener where he marked his card with one eagle, seven birdies and a bogey. “It was a great day today. I knew I had to put pressure on those guys, they’re great players and the course is scorable, so to come out strong was great. "It’s nice that my last tournament of the year last season on the Asian Tour ended well, and I was able to carry that form into this year. I’m not putting any expectations on myself but it encourages me because my game is where I want it to be,” said the 26-year-old American. The next All Thailand Golf Tour event will be the Singha E-San Open 2019 at Singha Park Khon Kaen Golf Club, Khon Kaen on February 7-10.